KATHY GARVER FULL INTERVIEW with Torchy Smith. Kathleen Marie "Kathy" Garver (born December 13, 1945) is an American stage, film, television, and voice-over actress most remembered for having portrayed the teenage niece, Catherine "Cissy" Davis, to series character Uncle Bill Davis, played by Brian Keith, on the popular 1960s CBS sitcom, Family Affair. Before that, she was cast as a slave in the film The Ten Commandments (1956). Garver authored The Family Affair Cookbook (2009) and since 2008 has co-hosted the Comcast ... See More television talk show Backstage! With Barry & Kathy.Garver was born in Long Beach, California, the daughter of Rosemary Schmoker and Hayes Gilbert Garver. She was raised Roman Catholic and attended a Catholic primary school. When she was nine, she tried her hand at acting and was cast in I'll Cry Tomorrow, but her most famous movie role was that of one of the young slaves in The Ten Commandments. Between the mid-1950s and mid-1960s, the young actress worked with, in addition to her association with Brian Keith, such actors as Marvin Miller, Chuck Connors, Peter Graves, Scott Forbes, Dan O'Herlihy, Kurt Russell, Fess Parker, Vince Edwards, Richard Chamberlain, Patty Duke, Anne Lockhart, and James Franciscus. Garver later moved to San Bernardino, California, where she entered Pacific High School in 1960 and remained there until graduation in 1964. After high school, she entered UCLA, majoring in speech and drama, until her graduation in 1968. Garver was a member of Pi Beta Phi Fraternity for Women at UCLA.In 1965, Garver played a youthful Isadora Duncan, with June Lockhart as librarian Ina Coolbrith, the first poet laureate of California, and Sean McClory as the poet Joaquin Miller, in the episode "Magic Locket" of the syndicated western television series, Death Valley Days, hosted by Ronald Reagan. In the story line, Coolbrith develops a tenuous friendship with the teen-aged free spirit, "Dorita Duncan". The two have identical portions of a broken locket. In 1966, while studying at UCLA, she auditioned for, and won, the role of "Cissy" Davis, the eldest of the three siblings on Family Affair. Garver had been a fan of Keith since she was ten years old and had guest-starred on his earlier CBS series about the Cold War, Crusader. 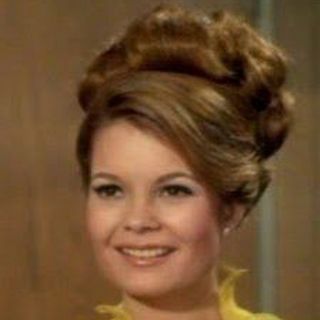 Family Affair lasted for five seasons and Garver would play the role of "Cissy" until the show was cancelled in 1971. She and Johnny Whitaker are the last two surviving cast members from the series (and they share the same birth date: December 13). Garver provided the voice of Firestar on the Saturday morning cartoon Spider-Man and His Amazing Friends. She voiced Storm, as well as other female guest characters. In the 1990s Spider-Man cartoon series, she played the voice of Miss America. Garver was the voice of Alice Mitchell in the Dennis the Menace cartoon special Mayday for Mother and Pepper in Chuck Norris: Karate Kommandos. Her other voice roles included the television series Fonz and the Happy Days Gang, The Tom & Jerry Kids Show, Droopy, Master Detective, The New Yogi Bear Show, The Richie Rich/Scooby-Doo Show and The All-New Super Friends Hour, the cartoon special Marvin: Baby of the Year and the anime film JoJo's Bizarre Adventure. In addition to her television work, Garver has lent her voice talents to numerous commercials, toys, and audiobooks.Her voice has been heard in the films Apollo 13, Ransom, and Backdraft which were all directed by Ron Howard, and Jingle All the Way directed by Brian Levant. She appeared as a cable car tourist in the film, The Princess Diaries. Garver has produced, narrated, written lyrics, and composed the music for eight audio Beatrix Potter tales and eight Mother Goose based audiotapes for Smarty Pants, Inc. Her Beatrix Potter tapes have sold over two million copies and have won numerous awards. She has recorded books for Brilliance Audio, Dove, Listen and Live.